The swatch was too pretty. I had to stop it early so I could start on the sweater. Gauge is spot-on anyway, based on this snippet. I think plain main + multicolored accent is going to be my new favorite trick. Also: Roland Young is freakin’ hilarious so far in Topper. He usually played a very staid British type, or sometimes the man who you’d think would be the staid British type (such as the flirty and drunken Uncle Willie in one of my favorite movies, the Philadelphia Story) so I haven’t seem him do physical stuff before. You can tell this is a Hal Roach film by the director’s sometime use of speeded-up footage. Hey, it was comedy gold in silent days! But you know, Hal Roach lived to be a hundred and kept active in the biz until the end. His imdb producer credits top 1000. I have fond memories of my dad unspooling Hal’s Laurel and Hardy movies on a movie projector in the living room. I’m not going to begrudge the man a few wacky camera tricks. Frogging the swatch – I need every yard for this sweater! Hubby didn’t get off work until after 5, and the yarn store in Davidson closes at 5. My efforts to spare my daughter a long, boring car ride were for naught anyway. My cousin (he is fine) called from the hospital and needed someone to give him a lift back to his car. He had chest pains at work today, and the nurse there called 911 and he got an ambulance ride. Said car was about 20 miles from the house. The yarn store is 25 miles from the house. Sorry, kiddo. This has not worked out to be the Bestest Week Ever. All I want is some freakin’ Lorna’s Laces Worsted so I can make this freakin’ baby sweater out of machine-washable wool, and every day that passes is another day that I can’t be working on it. Grumble grumble. On the up side, The kiddo and I went to Pike’s and I got a black cow while she got a strawberry sundae – with salt and pepper, of course. So there was still some fun had. Well, I had hoped that I’d be able to drop the kidlet off at My Gym for the morning, but I called yesterday and they’re booked up for the week. I love my daughter and I’m glad to spend time with her, but I’m not able to get as much wearwithstyle work done. I don’t want to fall behind on orders. I did toss together a listing for the Charlie Brown hat although it doesn’t look as pretty as I’d like. 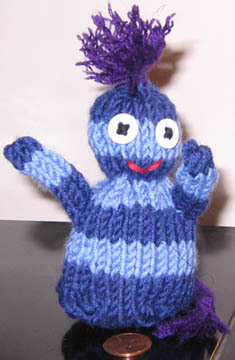 I’m going to try to get my friend’s 16-month-old to model it for me again before I send it off to its rightful owner. I haven’t been getting as much sleep, and I also had terrible dreams last night. Since the hubby has also been working late this week, there’s not the extra support to make up for my tiredness. Not the best couple of days. I’ve been trying to find some time to get up to Davidson without the kiddo, since that’s a 30-minute car ride to a boring destination for her, just so I can snag some Lorna’s Laces worsted. The hubby had to go in at 6:30 this morning, but is going to try to get out early to compensate, so that may be my window of opportunity. I’m just… tired. I’m not cut out to be a stay-at-home full-time mom. I think it wouldn’t be so bad if I didn’t feel the pressure of all I have to do weighing me down. Realistically, though, that’s probably what all moms feel. On the up side, I got my first order from Norway yesterday, which makes me happy. Also, I got up the energy to make dinner, some linguine with clam sauce, which turned out very nummy. The kiddo decided yesterday that she likes salt and pepper, particularly on ice cream. Little weirdo. 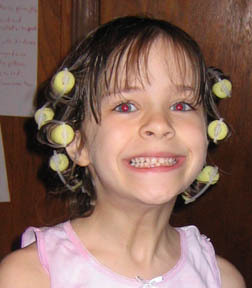 We stopped by Mom’s yesterday, and she gave us some foam rollers so that the kiddo could try her hand at the hair thing again. If I can just keep my head above water, I think it’ll be a good day today! A day of unexpected pleasures. DR weddings, Spring cleaning, and lack of time. Cut to keep your friends page manageable. All part of our friendly service! I’m awful when it comes to knitting new projects for people. I always dither and take freaking forever to decide exactly what I’m going to do, and I might change my mind several times before actually doing it. So finally tonight, I realized that I had several balls of high-quality machine-washable wool in my stash in excellent colors to make masculine baby-type stuff. Great! I’ll knit a striped baby sweater with that. I could just weep. How do you misplace three balls of Karabella Aurora 8? Now I’m back to being indecisive again, and making grand plans that I just don’t have time for because she goes out on leave on April 5th. They don’t ALL have to be brand new patterns; it won’t kill me to knit the same thing twice, will it? Wait, will it? Farscape and the tip of the tongue. You ever get that feeling that you’ve seen somebody before, but you don’t know where? I’ve had two clients who had measured their heads at 24+ inches tell me that their hats are just a hair looser than they’d like. My math is spot on. I’ve re-knitted one and am about to re-knit the other. From now on, I’m just not going to believe anyone who tells me they have a big noggin.